What would happen if millions of people around the world suddenly disappeared one day? 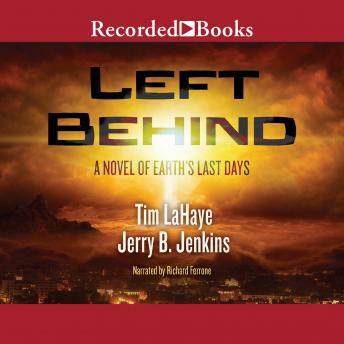 In this fascinating apocalyptic thriller, best-selling Christian inspirational authors LaHaye and Jenkins pool their considerable talents to answer that question. Narrator Richard Ferrone's unusually deep and hypnotic voice will keep you right in the middle of this not-unimaginable end of the world nightmare. Pilot Rayford Steele is contemplating adultery with a young flight attendant when over 100 of his passengers simply vanish, leaving vacated clothes and bewildered companions. Rayford and the others left behind must deal with mass chaos on top of personal loss. Among the passengers still left is star reporter Cameron "Buck" Williams, who just got the assignment of a lifetime: find out what happened and why. Theories abound, from Christian Rapture to alien abduction. Buck suspects secret meetings between international power brokers are somehow connected. And rising political icon Nicolae Carpathia seems to be at the center of it all. This is good stuff, not as good as Frank Peretti stuff, but still really interesting listen, I thought so even after watching the movie several years back. Truly enjoyed this book. Am hooked! Have started book 2 already.